About 40% of power transformers operated today, are 25 years old and more. It is quite logical that failures and faults happen more often on aged equipment than new. There are several approaches to the analysis of the causes of such faults, but it all comes down to transformer’s winding insulation, core and tap changers. 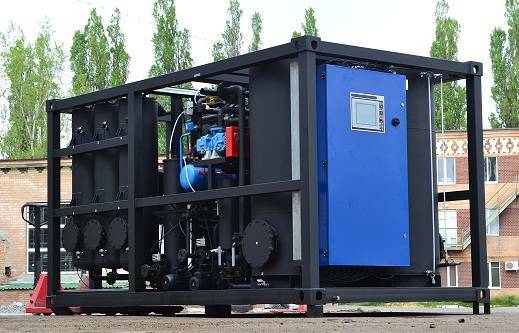 Energized parts of the transformer are cooled and insulated by mineral oils of high purity and low viscosity, which also protect the oil-impregnated insulation from moisture. Transformer oils should be stable to oxidation. If the transformer oil is stable, it can retain its performance (dissipation factor, dielectric strength etc) for long duration of time. When the oil is in good condition, the rest of the transformer works as it should. However, with time, under the influence of heat and chemical processes, the oil degrades. This results in appearance of various chemical compounds which adversely affect both the oil and the transformer. To prevent failure of expensive equipment, transformer oil should be regenerated. In the process of regeneration, oil passes through a layer of special sorbent. The sorbent has a certain internal structure, which facilitate molecular filtration, that is, capture of contaminants and products of oil decomposition. GlobeCore offers the CMM-R Regeneration plant. The sorbent used is Fuller’s earth. Fuller’s earth is a thin clay-like bleaching substance, which can decolorize oil and fat. This is why it is used in the CMM-R plant. An important advantage of Fuller’s earth is that it can be reactivated for multiple reuse. Projected average life time of the sorbent is around 300 reactivations, which translates into 1.5 – 2 years of operation. Oil can be processed continuously without downtime to replace or replenish the sorbent. Once the Fuller’s earth is completely exhausted, it can be disposed of as regular waste, posing no danger to the environment. The CMM-R removes decomposition products, solid particles, free and dissolved water as well as solved gases from transformer oil. In the process of regeneration the oil is heated and passes through a vacuum chamber. The heat and vacuum facilitate evaporation of water and emission of gases from the oil. Passing further through the sorbent, the oil is purified from decomposition products. Filters remove solid particles from the oil. Regeneration of oil with the CMM-R plant allows to restore chemical and physical properties of transformer oil. They become lighter and more resistant to oxidation. The CMM-R lowers dissipation factor and the acidity of the processed oil to regulation values. The most important thing is that periodic regeneration of oil can in fact extend transformer lifetime by 25 – 30 years. An important advantage of GlobeCore oil processing plants is their capacity to regenerate oil directly inside transformers, whether on or off line.